If you're curious what it would be like to live at the end of — or in the midst of — the rainbow, look no further than this village in Indonesia, which has gamely decided to paint itself in bright, eye-catching rainbow stripes. 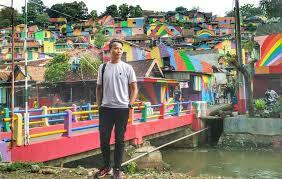 Kampung Pelangi, a hillside collection of a few hundred homes about 300 miles east of Jakarta on the island of Java, chose to go all-in on colorful exteriors for the town-wide facelift, hoping to improve local tourism. The project has worked a charm; the distinctive stripes make it ideal as Instagram bait and photography backdrops for visitors from all over, as evidenced in the thousands of images tourists are putting up on social media from the unusual locale. Local government had set aside just more than $20,000 to spiff up the town, the Jakarta Post reports, and ended up accepting the proposal of a junior high school principal to go in the direction of rainbow paint. The inspiration came from other Indonesian towns who had pursued similar, colorful schemes. The picturesque result looks a bit like a riff on some of the bright Brazilian favelas of Rio de Janeiro, or that Spanish town that painted itself entirely in Smurf blue — but, you know, better. Because rainbows. Take a look below.